The Library’s Riley and Ephemera Collection houses ephemera from a wide range of Victorian political and community organisations, including their badges (otherwise known as buttons or pins). Many causes produce badges which are worn to show support for an issue; for example the straight forward message ‘Ban the bomb’ or the blackly humorous ‘Nuclear war – seen one seen them all’. Badges relating to this issue are filed in the Riley Collection badge box labelled ‘Nuclear War’. Badges can also be worn to show inclusion in a particular group, for example trade union badges. We have a good collection of these in our badge box for ‘Trade Unions’. We often receive donations after a particular issue has been resolved and sometimes a badge that had a very clear meaning at the time can be a little hard to identify several years after the event. For example, a badge with the slogan ‘Save the conductors’ may be a bit obscure in 2014 but some readers will remember travelling on a tram and buying a ticket from a tram conductor. Despite a campaign to keep them, conductors were replaced with ticketing machines around 1996-1998. Badges relating to this issue are in the ‘Public Transport Services’ badge box. Badges are classified and put into boxes under broad subject headings. You will find the badges below in the badge box ‘Environment. Conservation’. To see what types of badges are in the Riley Collection, head to our Australiana Index. Type the words badge box, select ‘Source Title List’, and click to search. To access badge boxes you’ll need to place an order by phoning 03 8664 7009, or by placing your order at the information desk in the Library’s La Trobe Reading Room. Items will be delivered to the Heritage Collections Reading Room within 30 minutes of your request. If you want to see any badges in the evening, make sure you put in a request before 5.30pm, when requests stop for the day. 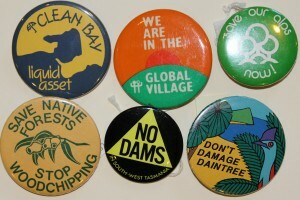 The State Library of Victoria Pictures Collection also collects badges. To get an idea of what is held, go to the pictures catalogue and type in the words badges realia. These badges will generally require 48 hours’ notice for retrieval. To find out more about researching political and environmental causes or trade unions, and the Riley Collection, head to our Protest, advocacy & dissent in Victoria research guide.